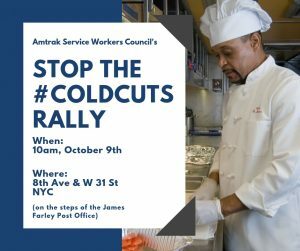 The Amtrak Service Workers Council (ASWC) will be holding a rally/press event in New York City on October 9th to oppose Amtrak CEO Richard Anderson’s cutting and outsourcing of on-board service workers, and the elimination of freshly prepared food on the dining cars. Passengers will instead be served cold boxed lunches…#ColdCuts. 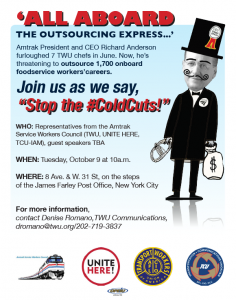 We encourage any-and-all to attend and show their support for quality food service and good-paying jobs!! The ASWC is comprised of three unions that represent Amtrak’s on-board service staff, including TCU/IAM, the Transport Workers Union (TWU), and UNITE-HERE.